Into the Light is a weekly radio program devoted to the finest art music of the past and present composed by women. Produced at KMFA, the fine arts station in Texas, it aired weekly for eleven years. It is now reaching out to other stations. Since the beginning of the time that man has conceived original music, woman has also. Yet until recently, the treasure-trove of great works by women composers has been hidden in the shadows. Often with little recognition or encouragement, women have composed for the same reason that men have  because the music in their minds and hearts longs for expression. The mission of our program is to bring the best examples of this music into the light. Each weekly one-hour program of Into the Light revolves around a theme. The music is selected for its artistic and historical significance. Biographical background about each composer is given by host Kathryn Mishell, as well as commentary regarding every work played. The goal of Into the Light is to present examples of music past and present, of all nationalities, in the best possible performances. A great range of compositional styles is represented. The criterion is always the quality of the music. Programs sometimes include interviews with composers or musicologists. The achievements of women composers need to be part of our understanding of the musical past. Without that understanding, we harbor a flawed and distorted image of the history of music. Further, to recognize women composers acknowledges the potential of all women. Ending the imposed silence of women composers  bringing their music into the light  corrects a past omission and empowers all women. Audiences have been surprised and delighted to learn about and to hear so much music, of such high quality, that is completely new to them. It is always a great thrill to discover something beautiful that may have existed for a long time, but that is new to the discoverer. 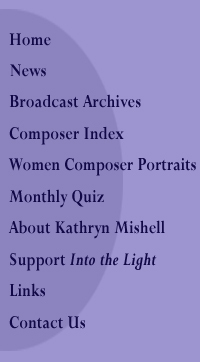 Exploring this unfamiliar world with Kathryn Mishell as guide is a weekly adventure to which many listeners look forward, because it is not only the composer who is being brought into the light; it is also the listener. 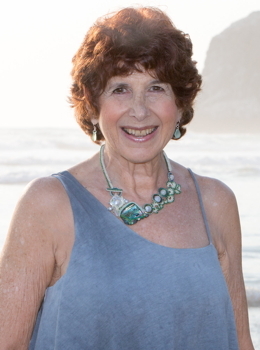 As producer of Into the Light, Kathryn Mishell is proud recipient of Gracie Awards for 2010, 2009, and for 2007, recognizing exemplary programming created for women, by women and about women in all facets of electronic media, as well as individuals who have made contributions to the industry. She also received the Communicator Award of Distinction in 2003, 2004, and 2008. Interested in bringing the finest music by women composers to your local NPR, PRI, or independent classical radio station? Visit our Support Into the Light page to find out how!